A recent press release by the World Meteorological Organisation (WMO) described recent global temperature changes, and highlighted extreme weather in the 2001-2010 period. Much of the press release is good, but here I will examine the accuracy of two statements. This first is not a very clear phrase. What does ‘significant’ mean, and what does a ‘decadal rate of increase’ mean? But, it suggests that the increase from the average of 1991-2000 to the average of 2001-2010 was unprecedented, and the second phrase suggests an acceleration in the rate of increase in global temperatures. These statements are misleading. 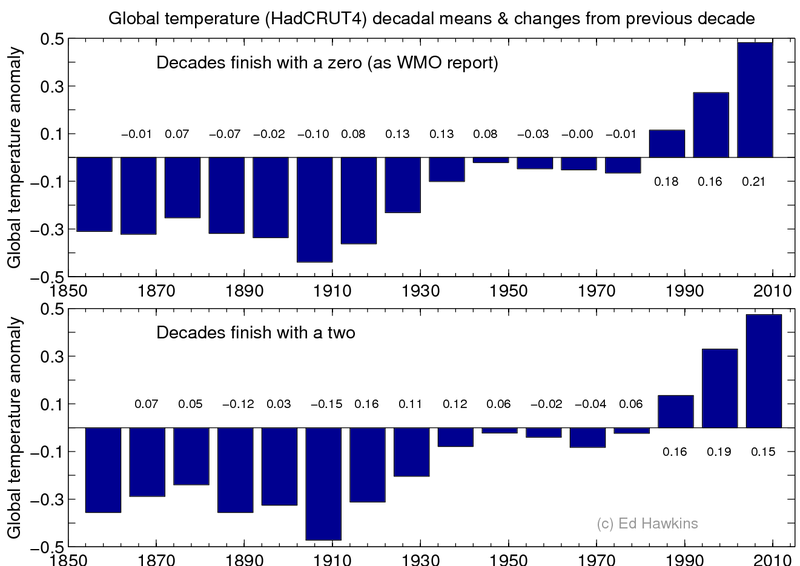 The figure below shows a similar bar graph to that used by the WMO showing averages of particular 10-year periods using HadCRUT4. The top panel shows the changes using the same definition as the WMO, with decades finishing with years ending in zero (i.e. 2001-2010, 1991-2000 etc). The largest change from decade to decade is indeed the last change, at +0.21K. The bottom panel repeats the analysis but defining decades to end in a two (i.e. 2003-2012, 1993-2002 etc). Now, the largest change (or even second or third largest) change is not to the most recent decade. And, in fact, the largest observed decadal increase is actually from the average of 1987-1996 to the average of 1997-2006, at +0.24K. Note firstly that different temperature datasets will give slightly different warming rates. However, 2001-2010 is the warmest 10-year period in the instrumental record. This is evidence enough of a warmer climate, but NOT of an accelerated warming rate. Decadal averages of global temperature using HadCRUT4, with text showing the change from the previous decade. You give a nice presentation of the statistical nicety of cherry picking the year end date. Nonetheless, don’t you think that balance requires you to be a bit stronger in praising the clarity of its WMO report’s presentation generally? Pointing out sloppy statements is critically important but so is repeating in your text the fact that both year end choices show the worrying climate trend very clearly. Not to make this abundantly clear every time allows misinterpretation of this kind of post by those clinging to every scrap of uncertainty they can quote to avoid action. Even now many scientists seem strangely unaware of this problem. But please do keep pointing this stuff out for us semi-science literate types to stay on the straight and narrow with the science. Best to be aware of and correct any mis-steps in communicating it as soon as possible. Hi Paul – thanks, yes, I strongly agree that most of the WMO press release is excellent (but I have not had time to read the whole report yet). And, yes, it is very clear that recent temperatures are well above the mid-19th century. This is plenty evidence enough that the planet has warmed. You are right that perhaps I focussed too much on the acceleration part. But, communication of these issues is so important. A single claim that is questionable can undo all the previous good work. And, we all make mistakes in communicating – myself very much included! Another problem with using the acceleration phrasing is that we know that the acceleration must stop at some point, and actually many of the CMIP5 simulations show this around now – a future post on this may be needed! Shame on you Paul Price. I prefer Ed’s science to come to me raw, through his own independent analysis. I don’t need it fed to me by people who misrepresent it but neither do I need it to pass some process to prove that it’s on message. Maybe you can’t see it but this is a clear attempt to get Ed to self-censure, as polite as you may be. Paul you are the flip-side of the same coin you are complaining about, neither serve the science well. Paul please explain to me how a graph can show that any particular trend is “worrying”? Paul Homewood has plotted the 10-year average of Hadcrut4, which is clearly decelerating rather than accelerating. It would be interesting to look at the history of when climate scientists started plotting global temperature in decade-averaged bins. Pingback: WMO Repeats “Hottest Decade Ever” Mantra | Watts Up With That? So I had a go at plotting the Hadcrut decadal trends starting from 1970. Essential the decadal trend from Jan 1970 to Dec 1979 is plotted at the Dec 1979 point. Then Feb 1970 to Jan 1980 is plotted at Jan 1980 and so on. The graph is here. Clearly decadal trends are just as cherry-pickable as anything else, we’re still at the mercy of the variability of the climate system. I would have to agree with Ed. The second statement that he highlights is hard to support when looking at all the data. Just as saying that the rate is decelerating would be unsupportable even though the trend in the decadal trend is downward over the whole period. One more thing. I think this paragraph in the forward of the actual report is just about spot on given where the science is at. This entire pretense at analyzing temperature curves indicates lack of understanding of how global temperature behaves. Ten year running average destroys information and should never be used. There is an inevitable fuzz surrounding the best temperature curves due to cloudiness variations. This limits their amplitude and if there are large peaks that stick out they are most likely of anthropogenic origin. You should use a semi-transparent overlay approximately as wide as the cloudiness factor. Once you have gotten this far, surprise, surprise, you will start recognizing El Nino peaks and La Nina valleys. They are not noise but carry information and should not be wiped out by computer processing. It is now up to you to make sense of what you have done. I suggest putting a dot at the midpoint of every line connecting an El Nino peak with its neighboring La Nina valley. There are a few places where this may not work but connecting the dots will give you a graph of the global mean temperature. Your finished product should look something like Figure 15 in my book What Warming? Looking at that figure you will see that the global mean temperature from 1979 to the beginning of 1997 can be represented by a horizontal straight line. That means no warming for eighteen years of the eighties and nineties. That is longer the current no-warming period of 15 years. Chances are you never knew this because temperature curves you are familiar with show a phony “late twentieth century warming” in that time slot. I knew that and demanded an investigation in my book. There was no investigation but two years later GISTEMP, HadCRUTand NCDC all gave up that phony warming and aligned their data-sets with satellite data in the eighties and nineties.. If you are using any of those I suggest you get hold of their data that came out late last year and use those instead of the outdated data I see AR5 groups using. Better yet, use UAH or RSS satellite data where available. This will give you the correct height of the El Nino peaks in 1998 and 2010 and the correct temperature platform for the twenty-first century which ground-based curves still exaggerate. Here are some words on the subdivisions of the satellite era. From 1979 to early 1997 we have an ENSO oscillation that includes five El Nino peaks. If your data-set does not show them get rid of it. By using the dots I spoke of you should be able to determine that the global mean temperature stays the same in that time frame. The super El Nino of 1998 follows this. It is the highest temperature peak of the century and should not be included in any kind of data processing or averaging. Right after it is a step warming, a temperature rise that looks like another El Nino starting up. Its cause is the large amount of warm water the super El Nino carried across the ocean. It raises global temperature rapidly by a third of a degree Celsius and then stops. In my book I named the seven year long high platform it created the twenty-first century high . WMO should know that this and not some imaginary greenhouse effect is the cause of the very warm first decade of our century. Normal ENSO oscillations were suppressed for this period but they started up again with the 2008 La Nina. Using dots you should be able to show that twenty-first century mean has been constant since 2001. That is the no-warming period we live in. Put this one and the one in the eighties and nineties together and there is only a small window left between the two. The super El Nino and its step warming just fit in there. Which means that there is no time left over for any greenhouse warming since 1979, a stretch of 34 years. If the earlier data are like this, and most likely they are, AGW becomes nothing more than a pseudo-scientific fantasy, one suitable for the waste basket of history. Tyndall measured the absorption of infra-red radiation by greenhouse gases in 1861. It is certainly not imaginary. Greenhouse effect is indeed imaginary despite Fourier, Tyndall, and Arrhenius. Arrhenius measured absorption by carbon dioxide, not by atmosphere as a whole. Carbon dioxide is not the only greenhouse gas, not even the most important one in our atmosphere. Water vapor is, and both simultaneously absorb outgoing infrared radiation. If several greenhouse gases simultaneously absorb there exists an optimum window for absorption that they jointly maintain. Ferenc Miskolczi showed that if we ignore minor absorbers and consider carbon dioxide and water vapor only the IR optical thickness of this optimum window for earth atmosphere is 1.87. If we add carbon dioxide to the atmosphere this will increase absorption and the optical thickness will increase. To restore it to optimum value water vapor must decrease. This is equivalent to negative water vapor feedback, the exact opposite of what IPCC does. As a result the addition of carbon dioxide to the atmosphere does not raise global temperature. Miskolczi published this in 2007 and in 2010 he reported experimental confirmation. Using NOAA database of weather balloon observations he studied atmospheric absorption of infrared radiation over time. He determined that absorption had been constant for 61 years while at the same time carbon dioxide went up by 21.6 percent. This means that the addition of this substantial amount of CO2 had no influence whatsoever on the absorption of IR by the atmosphere. And no absorption means no greenhouse effect, case closed. That is why greenhouse effect is purely imaginary and we have no warming now despite the huge amount of CO2 that has been added to the atmosphere. But worse yet – all claims that there ever was any greenhouse effect are obviously bogus because past warmings are all natural warmings. I will give you one good reason to believe me on this: the Keeling curve and its extensions. If you want to start a greenhouse warming you must simultaneously increase the amount of carbon dioxide in the air. That is because the absorptivity of carbon dioxide in the infrared is a property of the gas and cannot be changed. The only way to increase absorption and produce more heat is by putting more absorbing molecules in the air. Within the last 100 years there have been three cases where global warming suddenly increased. The first one was the early century warming that started suddenly in 1910 and ended equally suddenly with WWII cooling. The second case was in 1976 and was known as the Great Pacific Climate Switch. It raised global temperature by 0.2 degrees and was finished by 1980. The third case was the step warming caused by the super El Nino of 1998. In no case was there any record of a parallel increase of atmospheric carbon dioxide. The Keeling curve and its ice core extensions are totally featureless at these critical temperature values. It follows that none of these three instances of warming can be caused by greenhouse warming, and that covers the whole century. To repeat one more time: there has been no greenhouse warming for the last 100 years. Summary: greenhouse effect is real. I have seen van Dorland and Foster’s article before. Miskolczi regards van Dorland as an idiot. Here is what they say: “…water vapor and carbon dioxide have increased in the last four decades, meaning that the total infrared depth is indeed increasing.” I would take exception to water vapor increase but carbon dioxide certainly has increased and with it the total infrared depth. This is balanced by reduction of water vapor column amount and the result is no greenhouse effect whatsoever. Doing a reality check, have you noticed that despite the highest atmospheric carbon dioxide levels ever there is no temperature increase now as the greenhouse theory requires? Actually there has been no greenhouse warming at all since 1979, a stretch of 34 years. How likely is it that any of the earlier warming when there was much less carbon dioxide in the air was greenhouse warming? My guess is zero. We have had 2 years net of more of step up years. So why is the trend upward steeper than downward?